James Bradey and Warren Burns were 12 when they met. The friendship lasted through school and beyond as they backpacked through Europe ("as every 20-year-old-scumbag-Aussie does," jokes Bradey), where they were introduced to Tuscany's "family culture" and the integral role that food plays in Italian life. 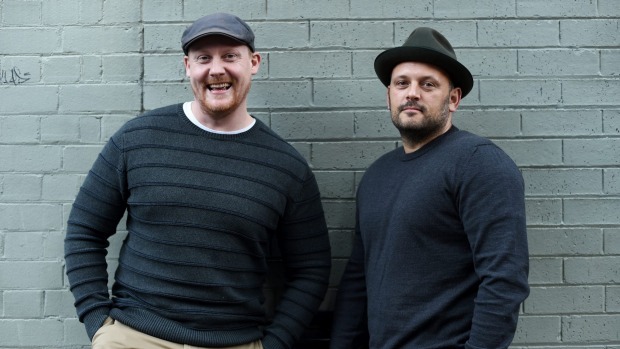 Since then they've worked in hospitality in Britain and around the world, winding up back in Sydney with five restaurants and bars of their own, including Grandma's, Wilhelmina's and Bistecca, a T-bone steak-only specialty restaurant near Circular Quay. 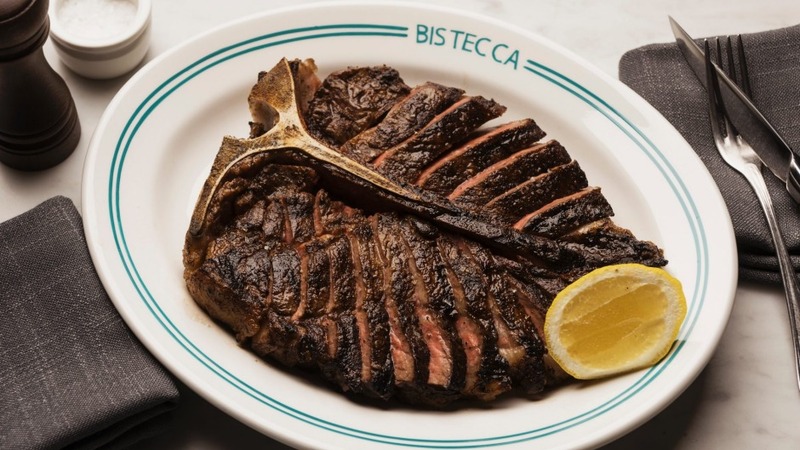 The pair have toured Italy several times over the years but before opening Bistecca in July they spent time there on an intensive, meat-seeking fact-finding mission, eating steak lunch and dinner every day for two weeks. Here's what James Bradey learnt from the experience. Warren and I ended up in a really old, well-established restaurant in Florence called Buca Lapi. We'd had a few wines at this point and had a heated discussion with the owner, arguing over how you cook the meat. The first thing that they don't do is season prior to cooking. Many years ago salt was a rarity, so that's just how they've cooked it. They also prefer to cook their meat blue-to-rare and they use a different type of cattle, called the chianina. Osteria Acquacheta, in Montepulciano. It's only a small restaurant and it's run by this very charismatic, extremely rude, full-of-bravado Italian guy. You're waiting at the door trying to get in, you don't know whether you've got a table, there's organised chaos out the front, you're standing on the street dodging mopeds and then when you come in they just bluntly say, "Vino rosso or vino bianco?" You order your meat, it's up on the butchers block and they chop it away. It's all very theatrical and romantic. If I'm honest, the steak wasn't amazing but everything else about it was. The steaks at butcher Dario Cecchini's Antica Macelleria Cecchini in Panzano, Chianti, were great and the restaurant was full of theatre, too. He gets his beef from Spain. Then there was a beautiful agriturismo farmhouse just out of Cortona called Agrisalotto: you're sitting in the garden, the husband is in the kitchen and the wife is running around serving tables; it's just their local wine and everything's very rustic but great. And the steaks at Buca Lapi in Florence (think silver service and white tablecloths) were good, too. There's Caffe Poliziano in Montepulciano, which almost has an old Austrian hotel feel about it and looks out over the Tuscan hills. In Florence there's a wine bar just outside the Mercato Centrale (the main market) called Osteria Nuvoli, where you can order a bottle of wine, a cheese plate and watch the world go by; they also have a dark cellar downstairs lit by candles that's worth checking out. But it was the Venice bars that really impressed us. You can get lost in Venice, with its tiny streets and canals, but there's hundreds of these little bars called bacari. 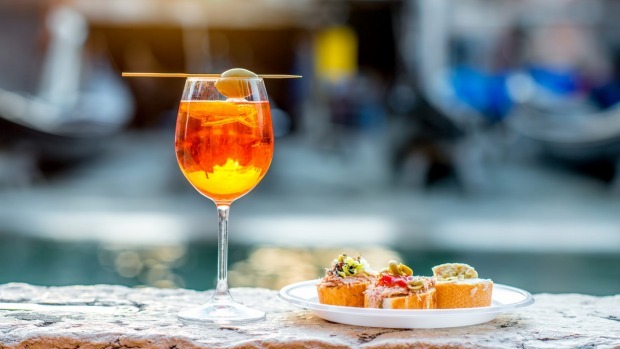 Each one specialises in a dish, such as baccala (dry salted cod), or lardo (cured fat with rosemary and spices), and you just move from one to the next, drinking a small 100-millilitre glass of prosecco here or a little glass of Tiziano there. Cantina Do Mori, although a bit of a tourist trap, has a fantastic atmosphere: no music, it's very, very dark, copper pots hang everywhere (you kind of have to crouch to get in) and they serve wine from barrels in the back bar in these little tumblers. Then there's Cantina del Vino gia Schiavi, a little bar where you sit out on a bridge and eat cicchetti, which is like Spanish tapas. And the third is Harry's Bar. We sat down and Warren ordered a Martini from the white-jacketed barman and started to request how he would like it. The barman turns around and says, "You'll get it cold, dry and strong." Then he stares Warren down. One second later out came this Martini, served with some olives on the side and – it was perfect. Yes, there were another three days in Bordeaux and three days in London eating steak as well, so it was a good two weeks of two-a-day steaks. When we did get back to Sydney there was certainly a couple of weeks of fish and veg being the only thing on the diet. But soon after we set about eating 40 or 50 different suppliers' steaks to check out which product we wanted to sell at the restaurant.